We never needed “new cutting edge research” to solve this problem. The problem we have and the solutions to it are all covered in the first year of an undergrad economics degree. Econ 101 macroeconomics, as I often point out, has worked pretty well…The point is that radical new theories haven’t been needed at all; off-the-shelf economics, tools we already had, provided plenty of guidance. He probably reads my blog. When people couldn’t make their debt repayments the banks suddenly became insolvent. Governments borrowed huge sums of money to bail them out and prevented a full collapse of the global banking system but were left with weak economies and high debt. Due to high levels of personal debt, rising unemployment and an all round lack of confidence in the economy, people switched very quickly from spending to paying off debt and saving. In the economy, my spending is your income and your spending is my income. Spending disappeared and a severe recession resulted. Governments initially responded by cutting interest rates. Low interest rates make saving less attractive and spending more attractive and in a normal recession this is enough to engineer a recovery. 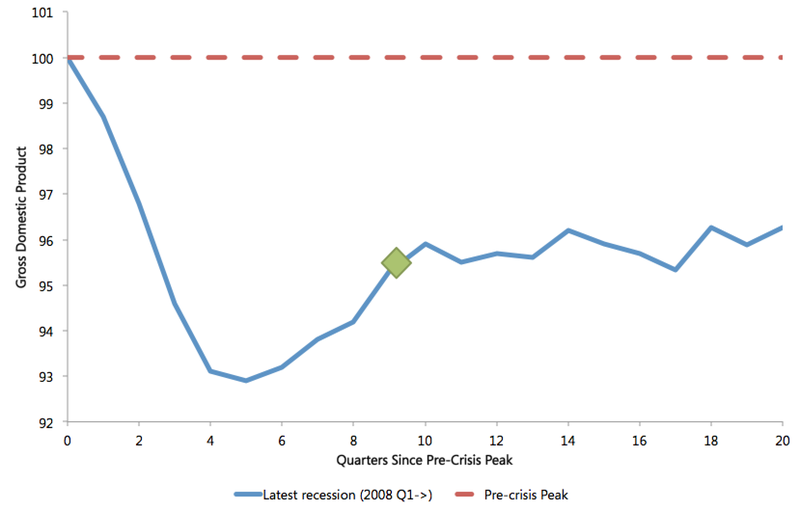 This was not an ordinary recession though and governments found that even with interest rates at almost zero, people continued to save and pay down debt rather than go back to spending. Low interest rates were not enough to fix the economy. As any first-year economics student can tell you though, monetary policy is not the only tool a government has to boost growth. If the people don’t want to spend, the government can increase spending and fill the gap. Many governments, either through incompetence or the blind pursuit of their political ideals did the opposite and cut spending, which had the predictable effect of exacerbating the problem. Governments likened their situation to that of an indebted household who must pay off their debt as fast as possible but the analogy, although easy for the public to understand, was disingenuous. In the economy spending and income are two sides of the same coin and in an economy suffering from a lack of demand from the private sector, cutting government spending was only ever going to lead to one thing. The amazing thing is that this is all basic, textbook macroeconomics. It is hard to comprehend how the government could try the opposite of what this stuff said they should do and then, when the economy entered depression, just sit around scratching their heads wondering why things didn’t work out. In 20, 30, or 40 years time when then next big recession happens, could we all take a look back on this period in history when our politicians, with their poo-pooing of basic economics, failed us so badly? Could we all take a look back on this period in history and say that we will never again make mistakes such as these? Let’s instead choose those basic economic rules that have, during this depression, continually got things right. Let’s remember the things we used to know. If you follow economics outside of this blog you will no doubt have seen this week’s big hoo-har about Reinhart-Rogoff (R-R). In case you haven’t I’ll explain what happened. A very common problem in statistics is confusing correlation and causation. Correlation between two factors means that as one changes the other does too. Causation between two factors means that as one changes it causes the other to change. This might seem like a small difference but it isn’t. It is very important. This is more easily explained with an example. If you were to plot on a map of Great Britain the location of every mobile phone mast and then were to plot the locations that children were conceived, you would get a striking correlation. This does not mean that mobile phone masts cause conception and it doesn’t mean that conception causes mobile phone masts. What is actually going on is that both conceptions and mobile phone masts are more likely to occur in areas of high population density. However, if you didn’t know the difference between correlation and causation you could easily, (and wrongly) conclude from your research that mobile phone masts increased fertility. There is another problem in implying causation from correlation. Even if there is a causal relationship it could run either way. Do mobile phone masts cause increased birth rates or do increase birth rates cause mobile phone masts? In the case of the R-R paper, not only did they decide there was a causal relationship in the correlation, they decided that it was high debt that caused low growth without entertaining the possibility that low growth might cause higher debt. Problem number two was that with the same set of data, no one else could reproduce the result showing some special tipping point at 90%. Lots of people tried it but no matter what they did, they couldn’t reach the same conclusion that R-R managed and because R-R had not published their workings no one knew how they’d reached that conclusion. This was problem number two. So move on three years to the current day and what has happened? Well in the interim, pretty much every austerity advocate had used this paper as proof of why austerity must be pursued at all costs. But this week after many requests, Reinhart and Rogoff released the Excel spreadsheet they’d made and on which they had based their findings. Oops. In addition to the previous problems there were three more very obvious problems with their workings. The analysis that R-R did was not over all of the available data. Oddly they had chosen to exclude specific countries’ performance in specific years with no explanation as to why they had done it. Worse still, if you included them the magic 90% threshold disappeared. In coming to their overall conclusion, R-R weighted certain results higher than other results using a method behind which no one can quite understand the motivation. Weight the results using any conventional means and guess what? The magic 90% threshold disappears. Most embarrassing of all was that there was a basic Excel error in the spreadsheet – they’d averaged over a column of numbers and got the range wrong so missed a bunch of the numbers out of the average. Guess what happens if you correct it? Yep. So will toppling Reinhart-Rogoff from its pedestal change anything? I’d like to think so. But I predict that the usual suspects will just find another dubious piece of economic analysis to canonize, and the depression will go on and on. And this is really the important point. The R-R paper only ever became as famous as it did because it told the “usual suspects” what they wanted to hear. It gave them some kind of economic credibility on which to base the policies that they wanted to implement anyway. R & R shouldn’t be blamed for all of the ways in which their paper was used – politicians and the media should take some of that, especially when there were so many question marks over it from the start. But the real thing I conclude from the whole debacle is simply this. When the crisis struck, governments had the option to follow the economic lessons we had learnt from the past. Lessons which had solved previous crises like The Great Depression of the 1930s. But they chose not to. They chose instead to pursue the things they wanted to do anyway and then cherry-pick any bit of research they could find to support it, irrespective of how many glaring problems it might have hanging over it. In all of this, until this week, the R-R paper was really their most coveted prize. So what have we seen in the intervening days since the paper’s public demolition? We have seen the stimulus crowd publicly claiming a massive victory over the austerity crowd and while that might well be the case, I again worry we might miss the important point here. What we’re doing here is arguing over one piddly little paper that gained fame because it formed a new economic theory that supported the policies of austerity. But that paper really should never ever have become as big as it did. We never needed “new cutting edge research” to solve this problem. The problem we have and the solutions to it are all covered in the first year of an undergrad economics degree. Yes, if a couple of Harvard economists come up with a new idea we should have a look at it but when it clearly had such big, unexplained problems from the outset, how could governments (ours included) end up basing their fiscal policy on it? I mean – would it really be so ridiculous to go with the things we actually know? When I was just a small rabbit, I received a computer game as a Christmas present from my parents. It was good – I played it for six months or so and pretty much played it to death. Another boy in my class had also received a game for Christmas and just like me he had also played his to death. Seeing an opportunity, I suggested we trade them. Computer games are expensive and neither of us, with our limited supply of pocket money, could simply buy all the ones we’d like so a trade would benefit both of us. We would each lose a game in which we had little remaining interest but we would each gain a new game that we hadn’t played before. We each valued the other’s game more than our own and so we agreed to trade. On returning home from school with a new computer game, my mum was immediately suspicious. My mum was not happy. It was a Christmas present, she said. I shouldn’t be trading presents that people had given me. She was cross. After Mrs Rabbit, my mum is the greatest person I’ve ever met but (also like Mrs Rabbit) making her angry is a bad idea. Oh well, lesson learnt. Only the lesson hadn’t been learnt. In hindsight, this was a rare occasion when my mum got it wrong. After the trade, Malcolm* and I were both better off. We each had a new game to play and we each got another six months of enjoyment from playing them that we would otherwise have not had. I can understand the concern if there had been some emotional attachment such as if we’d traded family heirlooms or swapped cats but the computer games had no emotional investment from anyone other than ourselves. We’re facing more and more competition from vast new economies like China and India. There are quite literally billions of people who are joining the world economy. That’s human progress. If we’re not careful, Britain risks being out-worked, out-competed and out-smarted by those hungry for a better life. And the reason I took issue with it is that it suggests that the better that other countries do the worse we’ll do. Like there is a limited amount of “economy” to go around and if the Chinese get a bit more they’ll be taking that bit away from us! It really does not work like this and George actually acknowledges this when it suits him. Ask him why our economy is weak and it’s all the fault of our European neighbours. The idea that Britain would be better off if all other countries were unsuccessful could not be further from the truth. 1. You get a bunch of children’s books (you need one per child). 2. You say that after this lesson there will be a special reading time where the children will each get to read a new book. 3. You distribute the books at random so each child has a book. 4. You ask them to each rate out of 10 how much they want to read the book they have during the special reading time. 5. You note down the results. 7. After the swaps are done you again ask them to each rate out of 10 how much they want to read the book they now have. What you will find is that the average score out of 10 is significantly higher the second time around. Why is that? Because the kids will only do a trade if there is a gain for both of them. Supposing Child A has “The Gruffalo” and Child B has “The Mole Who Knew It Was None Of His Business.” Child A thinks poo is funny and Child B doesn’t (idiot). So before the trade Child A rates his book as a 7 out of 10 and Child B rates her book as a 3 out of 10. After the trade Child A rates his book as a 10 and Child B rates hers as a 6. Note that Child B doesn’t think her book is the best in the world but she’d rather read it than read about a mole who spends the entire story wandering around with a (spoilers) dog poo on his head. Anyway, the important thing is that both children are better off and the trade would not have happened unless both of them would have been better off. It’s a brilliant exercise because it demonstrates why trade in the real world is so important. Take a look at Abu Dhabi for example. Abu Dhabi has lots of oil. Without trade, Abu Dhabi would be a poor country but with trade they are very rich. Lots of other countries want to use more oil than they can produce themselves and Abu Dhabi can produce lots more oil than they want to use themselves. On the other hand Abu Dhabi isn’t very good at making the machinery and vehicles needed to get the oil out of the ground and to its destination. Luckily there are other countries who are good at that so rather than having to try to build all that themselves they can get it through trade with other countries. Anyway, what I’m saying is that when one of our overseas friends gains economic growth it is not something we should fear. Instead we should see a marvellous opportunity for us to increase our trade with them and make both of us better off. Sadly it seems that all George sees is another reason to cut benefits for poor people. * His name wasn’t really Malcolm. I’ve never actually met anyone called Malcolm. He looked like a “Malcolm” though. It seems to me that the Labour Party are having a bit of trouble getting their message across, whatever it is. We know they don’t like the government’s policies but in most instances it’s very hard to get clarity on exactly what they would do instead. The government is clearly polling badly but I fear that much of that is more that the public think they’re rubbish rather than the alternative is especially good. I know it is the opposition’s role to oppose but I would like to think they would also be offering specific and clear alternative policies to those of the government. I know for example they believe that the government has cut too far and too fast but I’m not sure exactly what they would do instead. On Tuesday, Ed Miliband launched the Labour Party’s local election campaign with a speech that would give him the perfect platform to give us some details. As you probably noticed, Ed managed to coincide his speech with the death of Margaret Thatcher. For a party leader who has severe trouble getting his message across this was fantastically unfortunate. What was surely destined to be the top story on the evening news was reduced to a couple of minutes at the end. As Margaret’s spirit descended from this world to the next, I’m sure that last achievement put a smile on her face. But anyway, Maggie aside, was the speech actually any good? I don’t really think it was. He did an ok job of criticising some of the government’s failures on the economy, their income tax for rich people and their linking of the Philpott case to the need for welfare reform but again, their was precious little about specifically what policies Labour would implement instead. One of the fastest growing businesses on the high street are the payday lenders. In hard times, it is no wonder people turn to them. But often they just engulf people in debts that they cannot pay. Interest rates of over 1000 per cent. Of course we need national action to cap the cost of credit. But we also need local action too. Currently if a bank branch closes down, a payday loan shop can move in and open up in the same place. Even if there’s already a payday lender just down the street. And there’s nothing the local council can do. That can’t be right. How can we return to a healthy economy so that real wages are not going down? How can we make banks start lending again so that people actually have the option of more affordable borrowing? How can we address poverty and inequality in our society? How can we better educate the public in personal finance so that they don’t take loans that they cannot afford to maintain? This is a complex problem requiring a non-simplistic solution. Simply preventing payday loan companies opening shops does not address any of the real issues and if people want a payday loan without a local shop, I doubt they will struggle to find it on the internet anyway. At the next election I want an option to vote for a party who will have thought these things through properly and give me some sensible policies for which I can vote. Not a couple of “quick-fixes” that miss the very serious underlying issues that cause a problem like this. This policy is just an example of a wider concern I have with the Labour party. The current government is truly abysmal and for any kind of well-organised alternative, they are there for the taking. If however, the alternative is a party who is not prepared to commit to specific policies that address the true problems I can’t see myself being motivated to get off my arse for them on election day. Yes, that’s still two years away but the clock is ticking. So, before it’s too late – could the real opposition please stand up? Yesterday, George Osborne became the latest Tory politician to be sent out to demonise the poor and made, I think, one of the worst speeches I have ever heard. You can read the full transcript here if you like. All done? Well then – allow me to retort. For too long, we’ve had a system where people who did the right thing – who get up in the morning and work hard – felt penalised for it, while people who did the wrong thing got rewarded for it. Ok, so let’s get this out of the way quickly. If this were the case then why would people ever have had any incentive to work at all? If people were penalised for working and rewarded for avoiding work, people would not work. Something doesn’t add up and we can see that the statement from the chancellor is purely wrong by comparing how the value of job seeker’s allowance has faired relative to wages over the past 30 years. Jonathan Portes does just that here. As you can see, with JSA being pegged to inflation, and earnings increasing on average significantly quicker, that JSA has steadily fallen from 22% of average earnings in 1979 to 15% today. Work is more attractive relative to JSA today than at any time in the past. 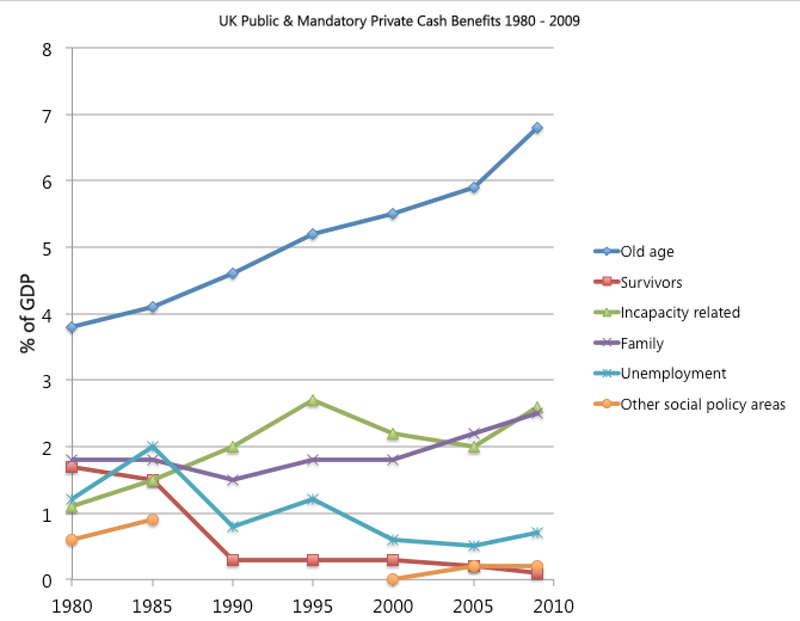 Now, those who defend the current benefit system are going to complain loudly. These vested interests always complain, with depressingly predictable outrage, about every change to a system which is failing. I want to take the argument to them. Because defending every line item of welfare spending isn’t credible in the current economic environment. Because defending benefits that trap people in poverty and penalise work is defending the indefensible. The benefit system is broken; it penalises those who try to do the right thing; and the British people badly want it fixed. We agree – and those who don’t are on the wrong side of the British public. I think this intentionally misrepresents what those of us who oppose benefit cuts are actually saying. I am not defending every line item of welfare. I don’t even know every line item. I’m sure it is not perfect and could be improved. I do dispute though that the benefit system is a significant factor in the reason that we have high unemployment. I don’t believe the reason that we do is that people who would otherwise be working are trapped, for the reasons I gave above. But! I have vested interests! Well let me divest them now. But I’m on the wrong side of the British public! Well, as FiatPanda points out here – the government’s way of measuring this is to say the least, underhand, misleading and dishonest. But should we be surprised that a large section of the public believes that benefits are evil? We have a government and a right-wing press who have mounted a huge campaign to convince the public that people on benefits are lazy scroungers. You’ve probably all seen the Daily Mail today right? Oh no! Jonny Foreigner is going to take all our jobs again! Except they won’t. When developing countries become developed countries we all benefit through increased trade and more jobs are created and we are all better off. China and India’s development is a huge opportunity for us to increase exports to those markets and boost growth. Well it would be if we had a government who could understand that, rather than thinking of these countries as foreign rivals who must be beaten at all costs. By taking hard decisions in the last few years to save money, this Government has cut that deficit by a third. Some politicians seem to think we can just wish away Britain’s debt problem. They want to take the cowardly way out, let the debt rise and rise and just dump the costs onto our children to pay off. I don’t think that would be fair. And I don’t think we’d get away with it. The interest charges would soar. Interest rates would rocket. People with mortgages would struggle. Businesses with loans would go bust. Jobs would be lost. Again, George is intentionally misrepresenting his critics. There are countless people who have made very strong economic arguments as to why the government’s economic policy is flawed and have described sensible alternatives. Paul Krugman, Joseph Stiglitz, Jonathan Portes, David Blanchflower, Brad de Long, Martin Wolf etc. etc. are not “wishing debt away” when they use the discipline of economics to analyse the mess the government has created. Oh, and interest rates would not soar – I covered that here and there is absolutely no economic basis for such a claim. Until recently we were told interest rates would soar if we were to lose our AAA credit rating. What happened when we did? …one in every six pounds of tax that working people like you pay was going on working age benefits. To put that into perspective – that’s more than we spend on our schools. That’s one reason why we’ve got such a big deficit. No it isn’t. The Labour government was running a surplus between 1997 and 2003 with the same benefits system. The reason we have such a big deficit is because the banks caused a huge financial crisis. Still, can’t blame the rich can we? Not when the poor are such easy targets. So our reforms have one simple principle at their heart – making sure people are better off in work than on benefits. But they already were! Just look at the figures! A million people didn’t decide when the financial crisis hit that unemployment benefit suddenly looked good and therefore quit their jobs. When I took this job, I discovered there were some people who got £100,000 a year in Housing Benefit. No evidence is given for this claim. No figures to show who they were, what their circumstances were or if they even really existed. But even if we take that claim at face value, it is hardly a reason to cut benefits for every single person who receives them. This again, is a thinly-veiled attempt to demonise the poor by taking the Daily Mail line that every one of them is a rich scrounger. Some have said it’s the end of the welfare state. That is shrill, headline-seeking nonsense. I will tell you what is true. Taxpayers don’t think the welfare state works properly anymore. When did this start to happen? When we created a system that encouraged people to stay out of work rather than find a job. Another gross misrepresentation of the facts. As we know, the system has over time seen unemployment benefit falling further and further behind working wages. The line about taxpayers not thinking it works is just more rhetoric designed to divide the country. I am a taxpayer and I don’t believe that the system encourages people to be out of work. If it did I would have chosen to be out of work. Our reforms are returning welfare to its most fundamental principles – always helping the most vulnerable, but giving people ladders out of poverty. So pay the vulnerable less money and they’ll just see the error of their ways and go out and get one of those freely available jobs? If you want to help people get back to work, fix the economy so there are some jobs for them to go to. The idea that people are just choosing to be unemployed at the moment is plainly stupid. There are no jobs because of a financial crisis caused in the banking sector but George seems to think it’s “fair” that the poor and vulnerable should foot the bill. And here’s another change we’re making. On Saturday, the top rate of tax will be reduced from 50p to 45p… In a modern global economy, where people can move anywhere in the world, we cannot have a top rate of tax that discourages people from living here, setting up businesses here, investing here, creating jobs here. If you don’t believe me, ask France. They’re planning to whack up their top rate of tax – and you know what’s happening? Job creation is down as people are leaving the country. The opposite is happening here because we are welcoming entrepreneurs and wealth creators – and the jobs they bring with them. So let me get this right. With income tax for rich people at 50%, the rich all go and live in Monaco but with income tax at 45% lots of rich people are all moving to the UK? That sounds suspicious. Perhaps we could have some evidence to back that claim up? Err…. no. So this all seems like smoke and mirrors for something more sinister. Fortunately George went on to explain exactly what that was. I’m a low tax Conservative. I believe what you earn is your money, not the Government’s money. So I want to take away less of it in tax, and leave you to spend it how you wish. Give me the choice between people choosing how to spend their own money, or a politician choosing how to spend it, and I know who I would pick. That’s good for the economy. That’s good for society – the more people get to keep from what they earn, the more likely they are to work, the more independent and responsible they will be. As much as George would have you believe it, tax is not a fundamentally bad thing. It’s true we could do away with it and just pay for everything directly but where would that leave us? A couple of months ago there was a massive pot-hole in my road. The council came along and filled it in, (paid for by taxes). Now we could say that we won’t pay taxes to cover road maintenance and when a pot-hole opens up in my road the residents will all club together and pay to repair it…. Oh, but wait a minute, I don’t have a car – I don’t care. I’m not going to pay for it. And actually most of the traffic coming down my road probably isn’t from people that live on it anyway. I receive the tiniest share of the pain from the pot-hole in my road, so why am I going to put money towards it? But then everyone will have this attitude and the pot-hole won’t get fixed and over time my road will fall to bits without anyone doing anything about it. At the moment the council collects my rubbish, (paid for by taxes). We can pay for it individually ourselves but I suspect a lot of people, rather than pay individually to arrange to have it transported to the local landfill are just going to go out in the middle of the night and wang it in each other’s hedges. Or how about the armed forces, (paid for by taxes)? The next time that there is a need for a peace-keeping force to protect citizens in a third world country beset by civil war, are we all going to have a whip round and see what kind of private army we can muster? This is, of course, all nonsensical government spin. While it is easy to make it sound good that I should get my wages and then choose how it is spent, I don’t want to spend 100 hours a day deciding on how much I should be spending on the armed forces and how much I should spend on a hole in my road. Taxes have an absolutely essential place in any society and they are not just something that we can do without. Taxes have another important benefit though, and it is this one that I think the chancellor was hoping to curb. The overall tax system is set so that someone who is rich pays more than someone who is poor. This allows redistribution of wealth within our society. Although through taxes we all paid for the pot-hole repair, or the peace keeping mission, or the NHS, or the police, the richest amongst us did contribute more and the the poorest amongst us did contribute less. The multi-millionaire George Osborne would like to prevent redistribution of wealth from the rich to the poor. And this man has the gall to say that I have a vested interest.